The Welsh Corgi is a very distinctive canine. He may look like a small dog, but he has a heart to match that of any Mastiff. If you've never seen a Welsh Corgi before, you might be a bit perplexed by his unique looks. He may look like the product of crossbreeding between a German Shepherd and a Basset Hound, but this isn't the case. What Is the Canine Dosage of Claritin? The exact origin of these dogs isn't known, but it's generally accepted that they are of Swedish or Flemish descent. Although many dog enthusiasts simply refer to these dogs as Corgis, there are actually two distinct breeds of Corgis that were officially separated about 70 years ago when all interbreeding came to an end. Let's take a look at each, the Pembrokes and the Cardigans, to learn their similarities and differences. The Pembroke Welsh Corgi is known to be a great favorite of the Queen of England. 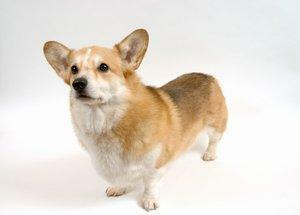 All Corgis are heavily built, long-backed and low to the ground. This is perfect for flushing game out of the fields, one of the Corgi's many talents. However, the Pembroke does differ from his Cardigan cousin in a variety of ways. The head of a Pembroke is somewhat fox-like, with slightly rounded ears held erect. This dog carries a deep, broad chest between fairly straight legs that are just a scant inch shorter than those of his Cardigan cousin. The feet point directly forward, and his long back ends in just the slightest nub of a tail. Pembrokes make very good family companions. These dogs are intelligent and learn quickly because their extreme devotion to their people makes them naturally pay attention. They also tend to be very good with children, protecting them as if they were part of a flock. This is fine as long as you don't allow it to get out of hand because all Corgis can be a bit strong willed at times. If your Pembroke begins to nip at anyone's heels, you'll have to fairly but firmly put a stop to it.Due to this, some feel Pembrokes are a touch more excitable than Cardigans, and require good socialization as pups to keep them in hand. Actually, this is sound advice for raising any family dog. The Cardigan Welsh Corgi looks slightly different than the Pembroke, with a longer muzzle and very large ears that have distinctly rounded tips. The Cardigan is also longer in back than the Pembroke, and has quite a good sized tail. The Cardigan's front is also slightly different. The front paws turn out just a bit. Cardigans carry a double coat that is harsher on the outside than a Pembroke's coat, but the undercoat is quite thick and soft. Colors are frequently accompanied with white markings. Cardigans are full of energy, but they are still very intelligent. Their devotion to their human family is unquestionable. However, Cardigans tend to be a bit more suspicious of strangers which make them appear stand-offish. They are generally more territorial than Pembrokes, and make excellent watch dogs, although you should never keep one of these dogs for protection. They will defend their people if they can, but many they risk injury while doing so.Just like Pembrokes, Cardigans adapt well to training, and can make very good obedience dogs. However, the physical traits shared by both breeds do not allow them to be very strong in agility competitions, although you can train them for this sport as a playtime activity. All Welsh Corgis share a few main health concerns. These dogs can easily become obese if you over feed them, so be sure they get adequate exercise and watch their meal portions. Obesity can contribute to spinal problems with these dogs. These dogs are also plagued by eye problems, glaucoma and PRA blindness being the most prevalent. Still, these dogs can live to the ripe old age of 12 or more with proper care. All Corgis shed twice a year, and require little grooming beyond those times. You can keep your dog in good shape by giving him a thorough brushing once or twice a week. Bathing should be kept to a minimum in order to preserve the natural oils that make these dogs' coats so water resistant. Intelligence, low maintenance and family devotion make the Welsh Corgi a wonderful choice for a companion. If you choose a Corgi for your own pet, be sure you will be able to give him a home for life, because he will likely be with you for many years to come.